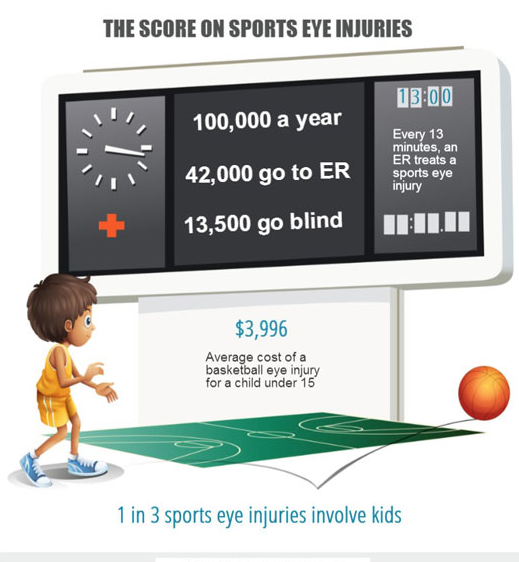 More than 40 percent of eye injuries that occur every year are related to sports or recreational activities. A recent study found that about 30,000 people in the U.S. went to an emergency department with a sports-related eye injury, a substantially higher estimate than previously reported. Three sports in particular accounted for almost half of all injuries: basketball, baseball and air/paintball guns. Cycling, soccer and raquetball also have high rates of injury. In support of Sports Eye Safety Month in April, our doctors at Grin Eye Care are offering athletes of all ages guidance on how to protect their eyes. Sports related injuries can range from corneal abrasions and bruises on the lids to more serious, vision-threatening injuries such as a retinal detachment and internal bleeding. Over 1/3 of these sports injuries happen to kids. Know the standards: Choose eye protection that meets American Society of Testing and Materials (ASTM) standards. See the Academy of Ophthalmology’s protective eyewear webpage for more details. Stay tuned for more important information throughout the month of April! As always, call us today at 913-829-5511 if you need an appointment or stop by our optical shop at any time during our normal business hours and our board certified opticians will be happy to help all of your eye wear needs!